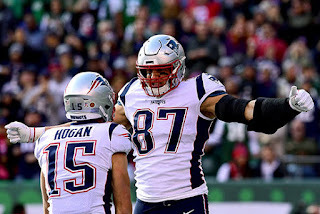 It was nearly a month since Rob Gronkowski suited up for the New England Patriots, and his presence was surely felt in his return this past Sunday. The star tight end has been dealing with ankle and back issues for a lot of this season and hasn’t quite been himself on the field. But in the Patriots’ 27-13 win over the New York Jets, we caught glimpses of the Gronk we know and love. The tight end scored his first touchdown since Week 1 on a tricky grab late in the first quarter and blasted the football into the ground shortly afterwards for his signature “Gronk Spike.” He finished the game with three catches for 56 yards. Gronkowski’s presence on the field has a positive ripple effect on the whole offense. The tight end played 69 of 70 possible snaps, according to Pro Football Focus. And in those, he was seen blocking in both the run and pass game, drawing double coverage on multiple occasions and opening the field for the other Patriot weapons. Now, let’s just hope the big guy can stay healthy.